Welcome to Mindful Music Studio! We are a small private music studio offering piano, violin, voice, and music theory lessons, composition and improvisation lessons, as well as recording services in Arlington Center. In addition to traditional modalities and classical repertoire, we offer specialty jazz piano lessons, jazz violin lessons, and jazz voice lessons. Exploring an instrument is a great way to expand your life experience! 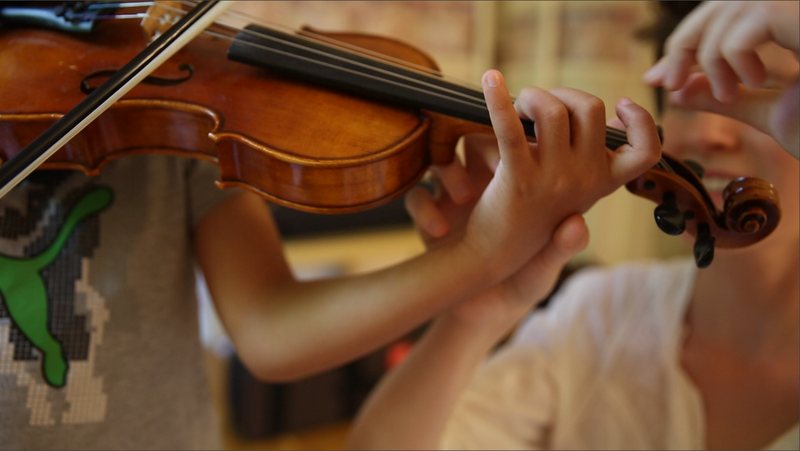 We are committed to helping both children and adults develop a relationship with their instrument, providing a nurturing environment for artistic growth. Building healthy instrumental and vocal technique is our priority. Through careful observation and use of the Alexander Technique and Somatic Voicework℠ principles we work to prevent physical injury (pain, tension, vocal fatigue, carpal tunnel syndrome, tendinitis, etc) and frustration that arise from bad habits and poor basics. While each student has a unique curriculum based on their needs and learning style, mindfulness is a core component. Many people prefer the convenience of in-home music lessons. It doesn't matter for adults, but we recommend that you bring your child to a teacher's location. From our experience children have a better time focusing and learning a new skill in a slightly less familiar environment. We do consider in-home lessons on a case-by-case basis upon meeting the prospective family for an introductory lesson. If you are thinking about having your child try a musical instrument, it is crucial to start off with the proper foundation. Ariadna Kryazheva and David Harewood are the founders of Mindful Music Studio. Coming from very different backgrounds and musical experiences, David and Ariadna unite their perspectives in the ever-evolving process of discovery in music education. Ariadna is a violinist, vocalist, and certified Alexander Technique teacher. ​David is a pianist and composer. They are performing and recording artists of classical and jazz genres, as well as R&B/Funk/Soul, and Avant-Garde music. Music is a fun and empowering endeavor. However, learning a musical instrument is a complex task and requires commitment and a well-organized approach tailored to the student. ​We want to connect with aspiring musicians and parents of young students to share knowledge from our personal experience in the field of music education, as well as research on mindfulness, mental health, childhood development. We will send out a monthly blog post with practice tips and articles, FAQ, and more! Join the community of mindful parents to receive these helpful resources! If you have any questions on how to support your child's music education and practice, please email us.